Crispy, chewy and delicately spongy in texture with a delicious depth of yeasty flavor, you simply can’t beat these authentic homemade crumpets! When I moved to England where I lived for 7 years, there were a number of quintessential British dishes I was eager to try. Crumpets was one of them. We had no sooner settled into our hotel room than we went grocery shopping at the local Tesco and I picked up a package of crumpets for the following morning. We popped them in the toaster, slathered them with butter and jam and took our first bite. The verdict: The butter and jam were good. Excessively spongy in texture and bland in flavor, I wondered why, of all things, crumpets had earned such a prominent place on the British table. I swiftly wrote crumpets off as “tried them once and once was enough.” That is, until I ate some homemade crumpets at a friend’s house. My opinion of the famous crumpet made a 180 degree turn! Simultaneously crispy, chewy and delicately spongy in texture with a wonderful depth of yeasty flavor, I can promise you – homemade crumpets are everything they’re chalked up to be! 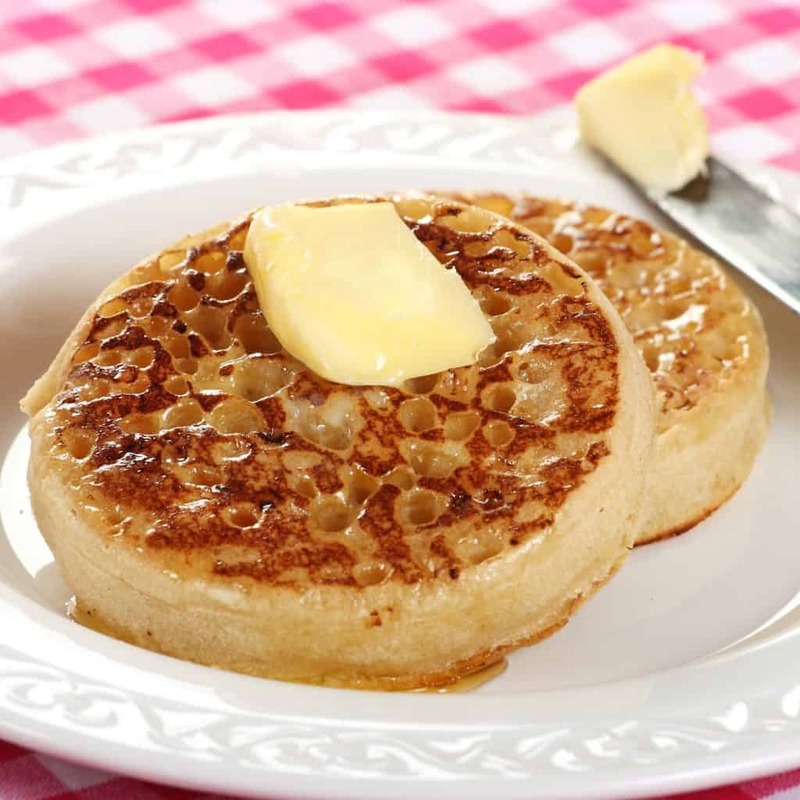 The name “crumpet” is thought to have Celtic origins referring to a “thin, flat cake” (i.e., Breton: krampouezhl; Cornish: krampoeth; or Welsh: crempog or crempot, a type of pancake). 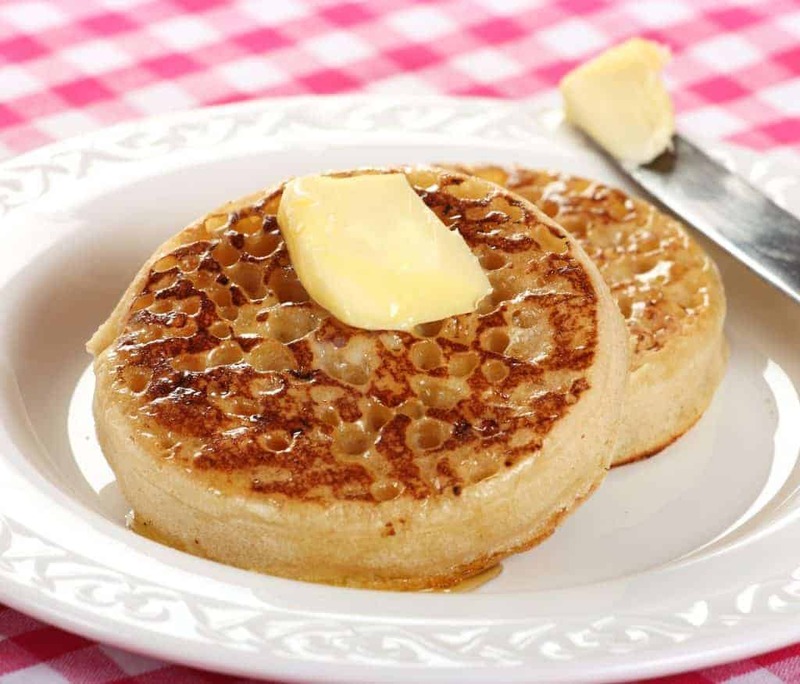 The crumpet has evolved over time; centuries ago crumpets were made without yeast and were flatter and harder, more like pancakes (what is also a Welsh variation, bara piglydd, known as pikelets, likewise enjoyed throughout Australia and New Zealand). During the Victorian era the yeast was introduced and crumpets have never been the same since – for the better. Once you’ve tried them you’ll agree, it’s hard to beat a homemade traditional English crumpet! Stir the sugar and yeast into the warm milk and let it rest for 10 minutes until frothy. In a large mixing bowl or the bowl of a stand mixer combine the flour and salt. Add the liquid to the flour mixture and stir/knead until a thick dough forms. 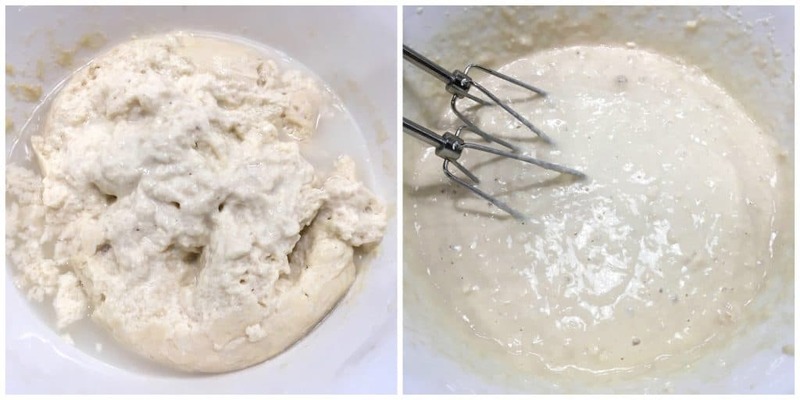 If using a stand mixer, use the paddle attachment and beat the mixture for about 3 minutes until a thick dough forms. Cover the bowl loosely with plastic wrap and set it in a warm place to rise for at least an hour or up to two (it should nearly double in size). 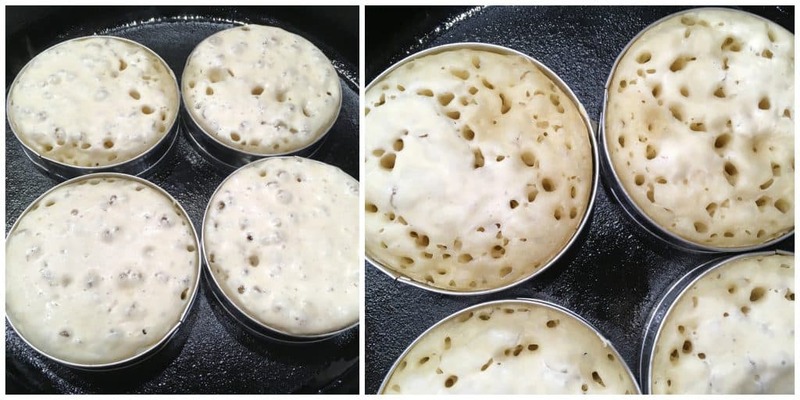 This stage is important for the formation of the bubbles that will later form the classic holes in the crumpets. Dissolve the baking soda in the warm water and add it to the dough. In addition to the previous proving phase, the baking soda is also what helps aerates the crumpets to give them their classic pores. Those pores allow the butter later on to soak beautifully into the crumpet and gives them their famous sponge-like texture. If using a stand mixer, beat the batter for a minute or two. Or use an electric mixer to beat the batter. If some small lumps remain that’s okay. Any remaining lumps will dissolve during the next resting stage. Cover the batter and let it rest in a warm place for at least 30 minutes (see note below comparing the rise of the crumpets depending on how long the batter sits). After 30 minutes the batter should be nice and bubbly. When you stir it, it will bubble and froth nicely. Time to prepare the crumpet rings. These are what will shape and hold the batter while the crumpets are cooking. 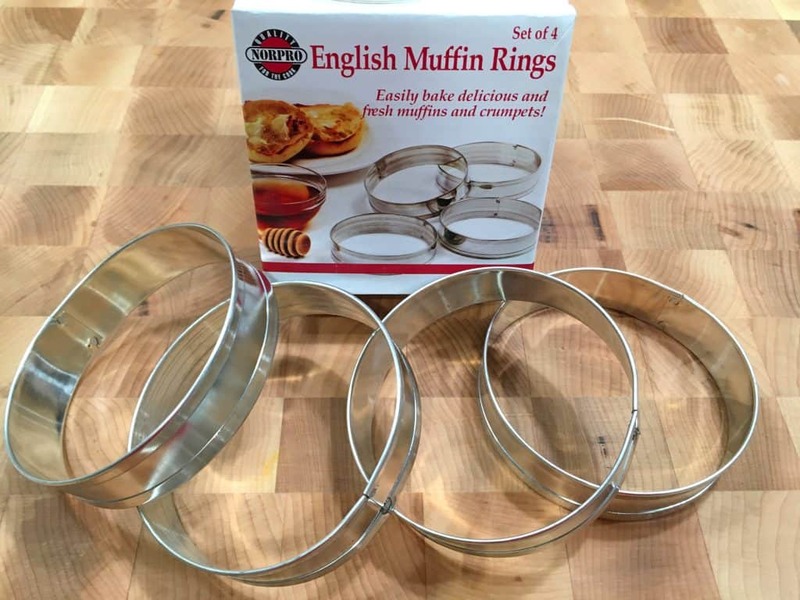 I use Norpro’s English Muffin/Crumpet Rings. They do the job perfectly. Oil the inside rims of the crumpet rings. Lightly oil the frying pan. You can use a regular skillet or a cast iron pan (my preference for even heating). I’m using my Lodge 12″ Cast Iron Pan. Heat the pan and rings over medium-high heat. 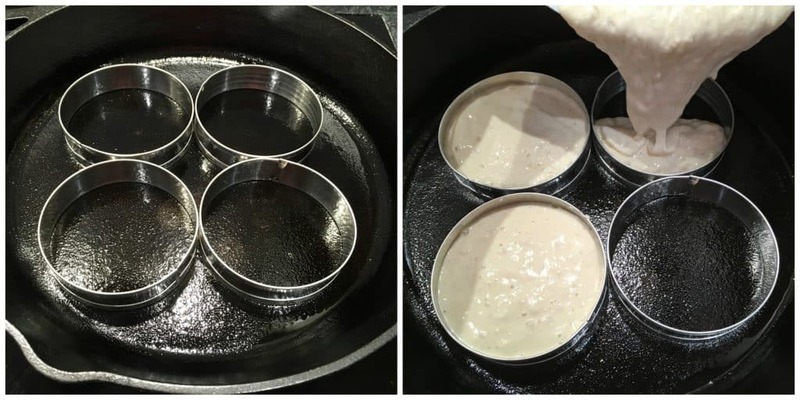 Once the rings are hot, pour the batter into each ring until it’s slightly more than half full. Cooking time will vary depending on your stovetop and frying pan but these will cook for 5-10 minutes. The batter will begin to rise and bubble on top. 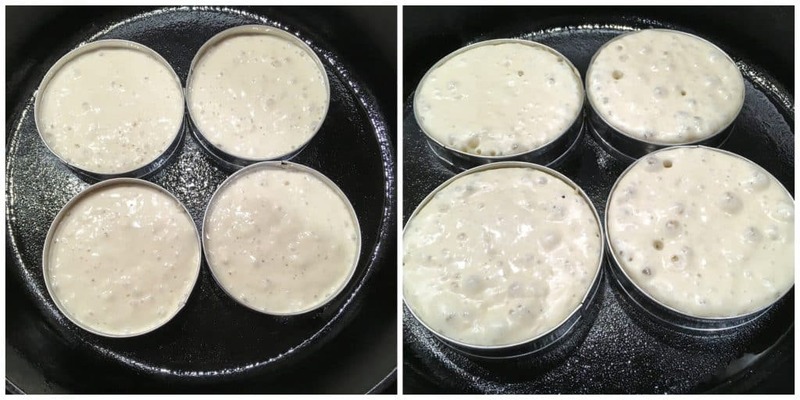 After several minutes when the tops are cooked and the classic pores/holes are present with the bottoms lightly browned, your crumpets are done. Traditionally crumpets are only cooked on one side only, not flipped over, and then toasted later. However, if you’re going to eat the crumpets immediately, I prefer to remove the rings and flip the crumpets over to cook an extra minute or two on the top side for a nice golden color and added layer of crispiness. If you flip them be careful not to move them so you don’t smear any uncooked batter and thereby cover over the pores. If you’re keeping them for later or plan on freezing them, you have the option to flip or not flip – either way you’ll want to toast them to reheat them. Your gorgeous, delicious crumpets are ready to eat! A note about letting the batter sit. It’s ready after sitting for 30 minutes (crumpets in above pics were made after 30 min) but letting it rest a bit longer will give you an even higher rise and a lighter texture. In the pic below I let the batter sit for an additional 20 minutes. See the side-by-side pic for a comparison of height. Try both and see which you prefer. Both are excellent but I slightly prefer the higher rise. Serve the crumpets immediately slathered with butter, jam, golden syrup or honey. To reheat later (these can also be frozen), toast them in the toaster. Note: Crumpets are eaten whole/open-faced and are not cut in half horizontally. This recipe for authentic traditional English crumpets yields and amazing texture and fabulous flavor! These are sure to become a regular favorite in your home! Stir the sugar and yeast into the warm milk and let it rest for 10 minutes until frothy. In a large mixing bowl or the bowl of a stand mixer combine the flour and salt. Add the liquid to the flour mixture and stir/knead until a thick dough forms. If using a stand mixer, use the paddle attachment and beat the mixture for about 3 minutes until a thick dough forms. Cover the bowl loosely with plastic wrap and set it in a warm place for at least an hour or up to two to let the dough rise (it should nearly double in size). This stage is important for the formation of the bubbles that will later form the classic holes in the crumpets. Dissolve the baking soda in the warm water and add it to the dough. If using a stand mixer, beat the batter for a minute or two. Or use an electric mixer to beat the batter. If some small lumps remain that's okay. Any remaining lumps will dissolve during the next resting stage. Cover the batter and let it rest in a warm place for at least 30 minutes (see note below). After 30 minutes the batter should be nice and bubbly. Prepare the crumpet rings by oiling the inside of each rim. (I use and like Norpro's English Muffin/Crumpet Rings.) Lightly oil the frying pan. You can use a regular skillet or a cast iron pan (my preference for even heating). I use my Lodge 12" Cast Iron Pan. Place the rings in the frying pan over medium-high heat. NOTE: Regarding how long to let the batter sit before using: It's ready after 30 minutes but letting it rest a bit longer will give you an even higher rise and a lighter texture (see blog post for side-by-side comparison pics). And more bubbles means more of those classic holes in your crumpets. Try both and see which you prefer. Both are excellent. This weekend while we’re snowed in would be the perfect time to make these! Crumpets are fabulous and homemade are the best. I have the rings and don’t make crumpets or English muffins nearly as often as I should! Now I want some crumpets! Wow I can’t believe you made these from scratch. They are wonderful. These look so good! I haven’t ever had a traditional crumpet. I would love to try these! Homemade is always better! :) I would love to try a homemade crumpet. Might just have to try your recipe out soon. I have to try these out for breakfast soon! I would love a couple of these for breakfast! This is an incredibly informative post. I can not wait to give these a try and with your detailed instructions, I am not as timid to try! I’ve never had a crumpet… but these look amazing!! These look so incredible and I want those muffin rings! These look SO good!!! Can’t wait to make these for breakfast!! This is my type of breakfast! Sounds and looks great! Breakfast of champions! Sounds like perfect way to start the day. All I want is carbs lately and this looks so tempting right now! It turned out perfectly. Oh my gosh, I used to love crumpets growing up! It would be so awesome to make my own. Wow, these are picture perfect!!! So wonderful with all that melty butter!!! Thomas would love these so much! Maybe I’ll make them for Christmas morning! I’m a sucker for crumpets. I eat them at least twice a week. Perfect for breakfast or a late night snack. These look amazing. Excellent tutorial and recipe, we thoroughly enjoyed these! I’m married to an Englishman who loves crumpets so I’ve been exposed to the store bought variety and I share your lack of enthusiasm even when they’re smothered in butter and cream cheese. I’d rather spend my calories elsewhere. I made this recipe over the holidays and wow…I’m a convert! For my first time making them they were much better fresh than leftover and heated in the toaster but I’ll try it again. Another wonderful recipe! YES!!! I know, Kim, I’m so elated over these crumpets. I’m with you all the way – if I’m going to splurge on carbs and calories it had better be WORTH IT! :) There’s simply no comparison between these and store-bought. And agreed, nothing beats freshly made, much better than leftovers. THANK YOU! Agreed, these are SO GOOD!!!! I was a little intimidated at first but your detailed pictured instructions were very helpful and my first batch and both batches since then came out perfectly. Excellent recipe, thanks so much for sharing! Terrific, Bridget, I’m so glad, thank you! No, I’m afraid not. The rings are what hold and shape the batter, otherwise it will run all over the place like pancakes. This is a standard recipe – but for pikelets. Crumpets is the s**thern name for them. Pikelets are entirely different, Mary. Pikelets are made without yeast, without rings, and are flat (what we call pancakes here). In my post I provide the background history: “One of the earliest mentions of the crumpet came from the English Bible translator, John Wycliffe, who referred to them as “the crompid cake.” The name “crumpet” is thought to have Celtic origins referring to a “thin, flat cake” (i.e., Breton: krampouezhl; Cornish: krampoeth; or Welsh: crempog or crempot, a type of pancake). 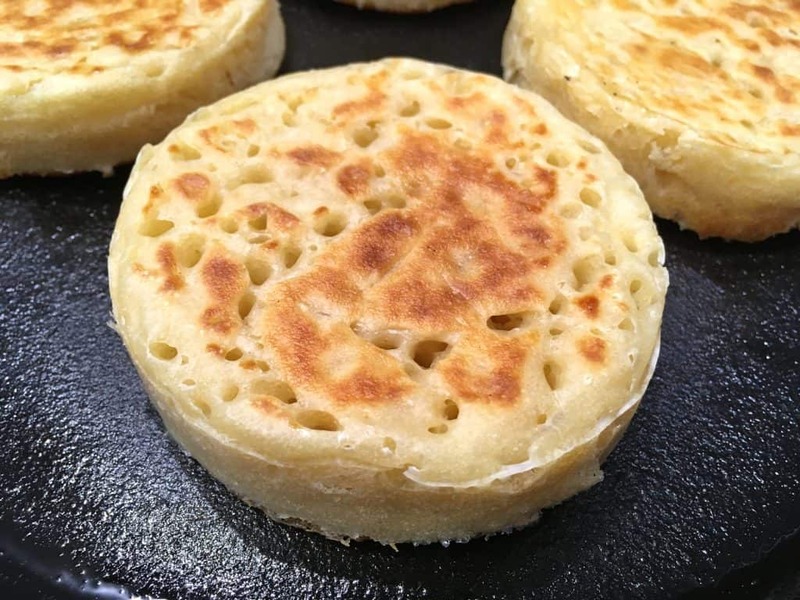 The crumpet has evolved over time; centuries ago crumpets were made without yeast and were flatter and harder, more like pancakes (what is also a Welsh variation, bara piglydd, known as pikelets, likewise enjoyed throughout Australia and New Zealand). During the Victorian era the yeast was introduced…” and those are what we know today as crumpets. These were amazing!! Thank you so much for this recipe and wonderful tutorial! I adore crumpets. I discovered them in Canada more than 40 years ago. I never thought I would have a recipe! I thought you had great recipes so I subscribed. You have more than given a reason to continue. Thanks for this great gift on a pretty crappy morning. Thanks so much, Patty, and I hope you enjoy the crumpets! 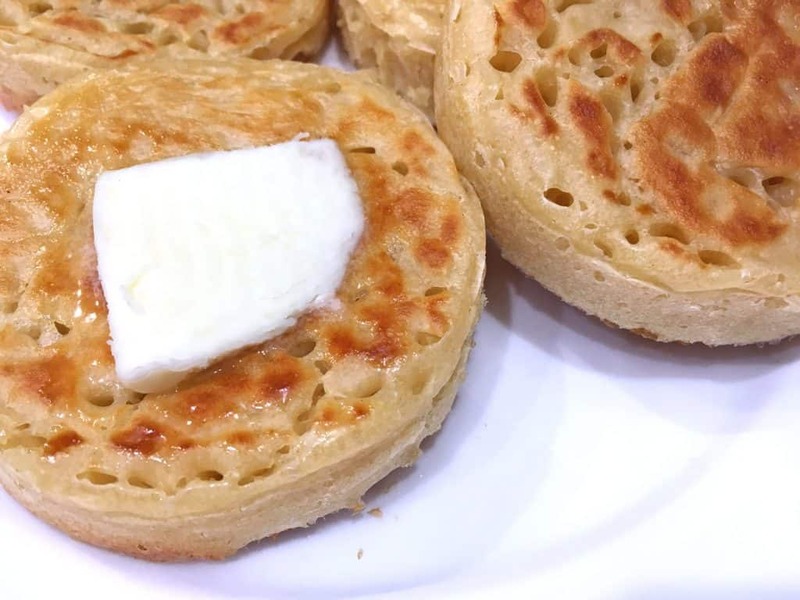 I have been living in the US for 30+ years and can only occasionally come across a packet of crumpets, I will definitely give this recipe a go they look perfect. 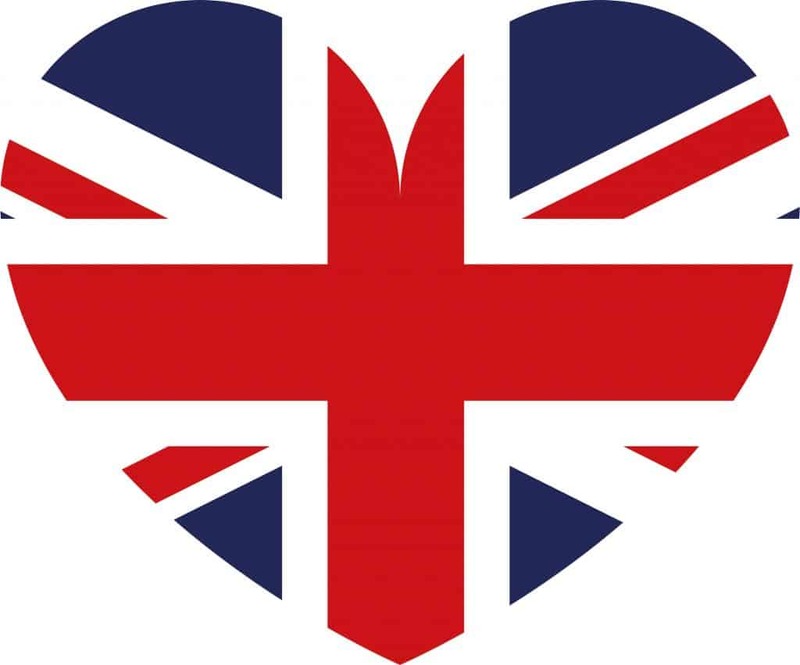 Crumpets, kippers and finnan haddie are things I really miss! Wonderful, Carolyn, I hope you enjoy them – please let us know what you think! Hi Kim, they were actually very good, I think I would like a little less dense, would that be letting them rise longer or adding a touch more baking soda? I did let them rise longer on the final rise. Hi Carolyn, the baking soda won’t impact the density much but yes, the length of the rise will. Also, homemade crumpets are a little more dense than store-bought anyway. I tried the recipe today – I had a difficult time with the crumpets cooking throughout – any suggestions? Hi Beth, the key is to regulate the temperature so that the crumpets have time to cook through without the outsides burning. Depending on the pan, cooktop and temperature you’re using they can take a little while to cook, so just be patient with them. Being American and never having visited England, I’ve always wanted to try crumpets. I’ve used this recipe several times, and I’m in love! The first time around, I had some difficulty getting the cook top temperature just right, and as such, there were a few that didn’t quite work out. The next attempt was much more successful. I allowed them to cool enough to keep their shape, filled the holes with butter, then smoothed on some jam. The texture and taste remind me of a cross between a fluffy biscuit, and a pancake. I make these every Sunday, and have them for breakfast throughout the week with a poached egg. Thank you! I’m so glad, Ambra, thanks for the feedback! Hi Jo, I’ll occasionally get a stubborn one like that – you can loosen them by running a butter knife along the inside of the ring. Very good recipe and a great way to spend Sunday morning in the kitchen. I do think the prep time shown at 20 minutes should be expanded to include the two risings of the dough (and batter). The prep time is much closer to 2 hours so this is not something you will pop together before going to work in the morning. Thanks. Fantastic, Tim, thank you! Yes, the 20 minutes refers to “hands on” prep time. Can you cut the recipe in half to make just 4 crumpets? Hi Hal, sure you can do that. These were an absolute delight and hands down the best crumpets I’ve ever had! This is my go-to recipe from now on. DELICIOUS! I’m so happy to hear it, Cami, thank you! Can the batter be stored overnight? Hi, I’d recommend refrigerating it overnight and then letting it sit for at least 30 minutes to come to room temperature before cooking. Hi Lynnette, this is a yeast-based dough and it’s highly dependent on the gluten to get a full rise. You’re welcome to try it, but just know that the texture and flavor will both be completely different. I’m Australian so crumpets are really common here. Never any problems finding any. Except last week when it was ANZAC Day and the shops were shut til 1pm. I made a batch and honestly, I don’t think I’ll ever buy them again. They’re so easy to make and they’re better than the ones from the shops. Thanks so much for the recipe! I’m thrilled to hear that, Kate, thanks so much for the feedback! No worries! I’ve actually just finished another batch to divide up and take for breakfast for my work week. These did not turn out for me they were gummy and raw In the middle no matter how long I Cooked them. I even tried to put them in the oven to help them out but nothing would work. They had good flavor but I had to spit them out. I wouldn’t of left this review but I just spent half my day doing something just to throw it out. Tried these today and a couple came out a little undercooked but that was due to me using rings that were too thick but still following the recipe stating to fill just over the half way point so maybe we need to note that this is a cooks error not the recipe. If you check out the rings suggested they are a lot thinner than the ones on the market for eggs or muffins. Hello! Will these possibly work with almond milk? Hi Missie, I haven’t personally tried them with almond milk but theoretically yes, that should work. For the lady wondering about muffin rings, the first time I made crumpets I used the smallest containers of pineapple. I cut both ends off and they worked perfectly. Just finished making a batch… In honor of the wedding today. They were wonderful! I used mini spring form pans without the bottoms, and they worked perfectly! Fantastic, Deb, I’m so glad you enjoyed them, thank you! I also made these in honor of the wedding! :) They were OUTSTANDING! The texture and flavor are fabulous, I’ll definitely be making these again! Awesome, Trisha, thanks so much for the feedback! Wonderful, Del, I’m so glad you enjoyed these and appreciate the feedback, thank you! Do you need to use the rings? Why not cook like pancake? Hi Teresa, because crumpets aren’t pancakes. The rings are what make them hold their shape while cooking. Hi, in England we have a passion (well some do) for marmite, my girlfriend and I love to slaver these with butter and marmite! Yum! Ugh I ate a whe pack of crumpets today. Lol. Store bought. I may have to wait a while until I try making these. Good job your post is well detailed I’ll give them a go! Hi Kimberly, I made these yesterday and we really enjoyed it. We had never eaten crumpets before. The taste reminded us of Dutch poffertes, but these were king size compared to those :-D.
Just one question; my dough wasn’t as thick as yours on the picture (step 2). Do you know why this could be? I kneaded by hand. Maybe not long enough? I solved it by adding (quite some) flour, but I think it will taste even better without the extra flour. Hi Bessie, I’m so glad you enjoyed them, thank you! Regarding the thickness of the batter, did you let it rest for the full 30 minutes? It thickens up a bit through the resting phase. Perhaps it may be a difference in geographic elevation? You could try adding a little less water next time. 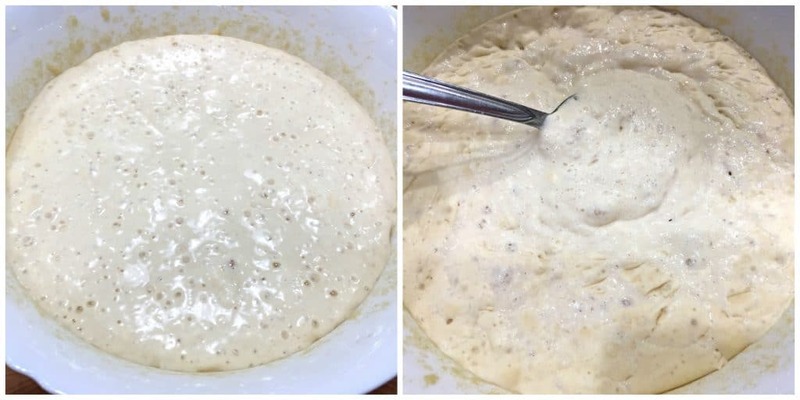 Also, it’s hard sometimes to tell from pictures (angle, lighting, etc), it may be that your dough was already thick enough, you could try testing it by frying one crumpet and see how it turns out. Hi Kimberly, thank you for your response. I think I didn’t explain it well; I meant that the batter wasn’t that thick before the one hour rise. It was still quit wet and sticky, therefore I added more flour. But next time I will try it with a little less water as you suggested. Thank you! Hi! I finally got to try this recipe today but it was a complete failure. Used my electric skillet set for 350f with norpro crumpet rings. After 6 minutes I removed the rings and flipped but the insides were gooey and gummy. Second batch reduced heat to 325f, used less batter and cooked for over 10 minutes. They were better cooked but still slightly gummy but way too thin. Third batch I forgot about and let cook on 325f for maybe 20 minutes. It was the best one. Ive made this using your recipe. They turned out amazing! 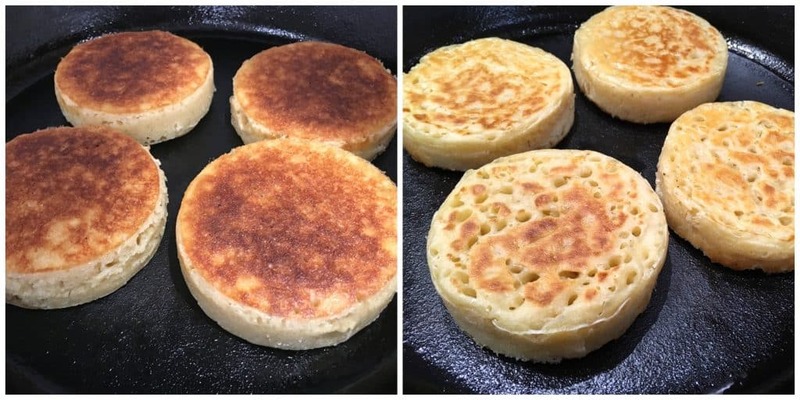 Living in North East Thailand, crumpets are impossible (almost) to find, however, I have just made our first batch following your excellent guidelines and they are delicious, thank you so much!!! That’s fantastic, John! A blessing in disguise then? Had the store-bought crumpets been readily available you may never have tried making them and missed out on the exquisite experience of biting into a homemade crumpet :) I’m so glad you enjoyed them, thanks for the feedback! Awesome, Paul, thanks for the feedback! Having tried several recipes to make these I believe this to be the best so far, thanks. I’m so happy to hear that, Andy, thank you! Fantastic, Daniel, I’m so glad they were a success, thanks for the feedback! I never thought of making my own crumpets but someone at work wanted to know what a crumpet was, so I googled it to give him the best description. Up pops a YouTube video with Chef Ramsey which I watch. Okay, looks easy but he didn’t really give measurements, so here I am with your recipe. Will try soon but wanted to share how my folks and I like them. Heat oven to 350. Put room temp or refrigerated crumpets on baking sheet (I like to use some parchment paper for easy cleanup) Add nice slice of tomatoe, a slice of cheese, very thinly sliced onion then a dash of black pepper. Put in oven. When cheese starts to look like it’s melting nicely and the onion has a chance to cook a little, turn on the broiler to brown it a tad. Yummy but watch, that tomatoe will be hot. That sounds yummy, Sandra, thanks for sharing! Just made these with my daughter who is a crumpets addict. We live in France so crumpets are only on offer when visitors bring them. We followed the receipe and had fantastic results. My muffin rings stuck at 1st but then changed from oil to butter and this worked better on the edges. We made 12. I have a photo but don’t know how to add. We will be making them again. Thanks for the receipe. That’s wonderful, Lianne, I’m thrilled to hear that! I’d love to see the picture, perhaps you could post it to our Facebook page? Thanks so much for the feedback! Hi, thank you so much for the recipe!! We all love store bought crumpets and these came so near them. The only issue I have experienced is that my crumpets havent had enough pores – do you have any idea what I did wrong? Wonderful, thorough and beautifully photographed recipe – thank you! And I especially enjoyed the bit of history regarding “crompid cakes” and the Welsh origination of pancakes. Adds zest to cooking to feel that gastronomic continuum! Thanks so much, Rebecca, and Happy New Year! Thanks, Dolly, I’m so glad you both enjoy them! The proving/fermenting stage is also critical for the formation of bubbles – I would try letting it rise in a warm place for longer next time. Made these just then, these were the first batch for testing. I’m still at the starting line of my cooking journey but these came out really well for a first attempt. It’s a credit to the Author that this recipe delivers, and my Mother who stepped in when I made mistakes (even if it was a bit annoying, I am still grateful). 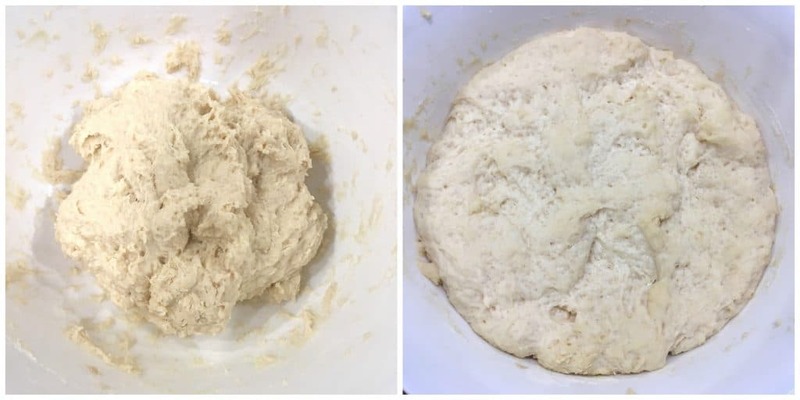 I was unclear by what the recipe meant when it said “until a thick dough forms” and I didn’t think to check the images, so I ended up kneading the dough until it was one cohesive ball, and after I finished kneading, I realised that we need to mix in water to make a batter. So kneading it until a ball much more suitable for baking bread was suddenly not such a good idea. I was still able to break up the ball and get it to mix with the water + baking soda solution but it was my mother who realised that we needed smaller lumps than what I was about to leave it as. After 30 minutes for the second rise, I only saw a few bubbles on top of the batter and got a bit worried. But I took a chance and left it for 15 more minutes, and that’s when I got good bubbling and a foamy consistency of the batter. It makes sense though since it is night, and there wasn’t anywhere warm to let the batter rest. I ended up leaving it in the microwave, which would have still been at room temperature since it hasn’t been used for a good hour or two. I cooked the crumpet on medium rather than medium high so I didn’t get as much of a browning on the bottom as I wanted. Regardless, I got good bubbling at the top and it definitely looked like a crumpet. The first one I tasted, I couldn’t believe it was so good despite the mistakes I’ve made. It was so soft, and fluffy, amazing straight out of the pan. A little bit oily so I’ll just skip the oil next time (was using a non-stick pan and the egg rings I used were non-stick too I think). My Dad and Sis said the crumpets were a bit too salty. I’m a salt tooth so I didn’t pick up on it. I’ll probably also cut the salt by about half for the non salt tooths around me haha. I used wholemeal flour instead of white flour because it is supposedly healthier, and it resulted in a more earthy/woody taste. I like it like that so I guess I’ll stick with it. tl;dr: Made a couple of mistakes but still turned out really well. Thank you Kimberly for sharing a great recipe. Fantastic, Henry, I’m so glad you enjoyed them and that they were a success – mistakes and adjustments and all! Thanks for the feedback! Wow…. just made these didn’t change a thing! Had mine smothered in butter and honey, Husband has his with cheese and pickles 😂🤣😂 thank you for sharing this great recipe will definitely be making again. Fantastic, Carole, I’m so glad you both enjoyed them, thank you! Mine were a disaster. No holes whatsoever. The batter looked great after the first rise but nothing happened after adding the baking soda. The batter stuck to the rings no matter if I used butter or oil. I give up. I’ve made crumpets before but they were nothing like these. I made 3 (ate them) and then made 3 more. These were awesome! Thanks for sharing. Fantastic, Donna, I’m so glad you enjoyed them, thank you! SO good! Followed this recipe exactly and had perfect crumpets full of holes and the BEST texture and flavor! Saving this recipe to use again and again! Fantastic, Daphne, thanks so much! I don’t know what I did wrong. My batter looked just like the photos but crumpets would not get done before burning on bottom. :( Any tips on heat setting, type of skillet…? I don’t own a cast iron one. I miss the Australian Toaster Bisquits that we used to buy in the grocery store. I made these and they turned out great, taste just like the bisquits only better. I happen to have mini cheesecake spring form pans and they make great molds. Thanks for sharing this. Fantastic, so glad you enjoyed them, thank you! Wow, i just finished making these and they are delicious. I tried other recipes before but this is the best one. Thank you. I’m so happy to hear that, Vanessa, thank you! 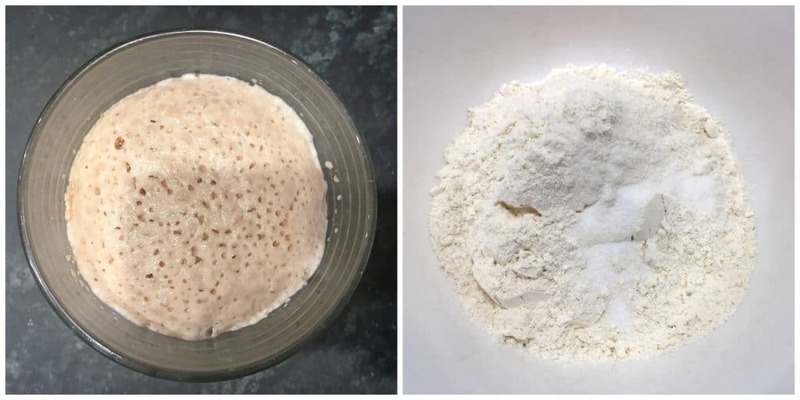 The recipe states that 1/2 bread flour can be used in lieu of only all purpose flour. Is the 1/2 and 1/2 preferred? Thank you. Hi Rosebud, all-purpose flour is what is commonly used but some people prefer to use a little of both, it’s purely personal preference. I usually use just all-purpose flour. I make these crumpets all the time and they are really awesome! i always make a double batch and cook them on a griddle.As i have had no luck finding non stick crumpet rings i have found that by using strips of buttered parchment paper to line the rings works really well and as the crumpets dry on top they can be easily removed with tongues ready for flipping over.I am British so crumpets are a must have in my house! i do fill my rings fairly full but as i set my griddle to 250 degrees they cook all the way through without burning. 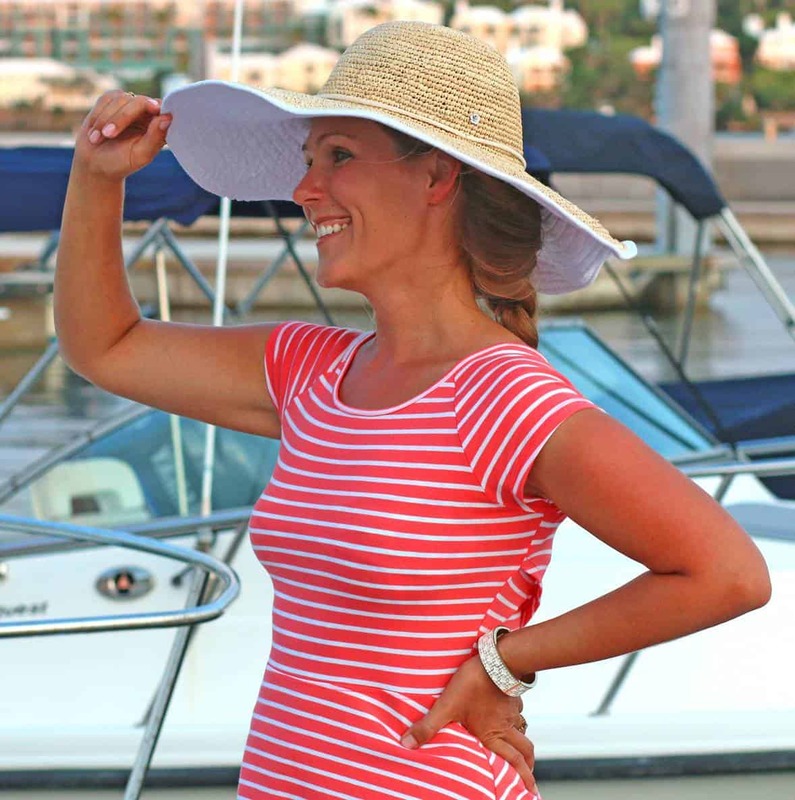 Wonderful, Dee, thank you so much for the feedback and tips!